Who doesn't love the combination of dark chocolate and pistachio? 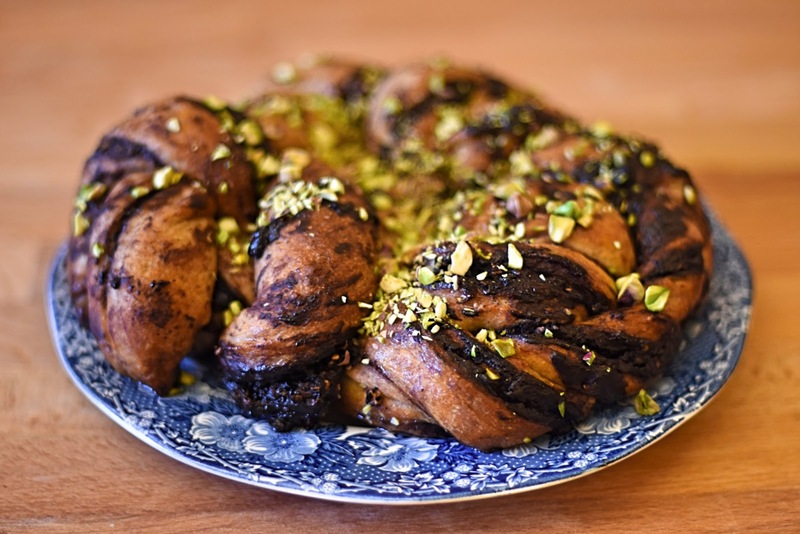 Whilst a babka is both messy and pretty timely to make I think the idea of this flavour combo wrapped up within a light and springy rye dough is the ultimate in indulgent weekend breakfast baking. I know we're only on Thursday and a few more working hours away from the weekend, but hear me out. There's a trick to making this guy in advance. Make the dough and the filling on a Friday or Saturday, at the same time or day by day, and leave to prove in the fridge till you're ready. So long as you have the bulk of the work done, all you need to do is allow it to get to room temperature before baking. I'm already looking forward to starting the next one ahead of this weekend to enjoy with a huge cup of black coffee in bed on Sunday morning. I recently gifted my giant coffee machine to my brother in exchange for an old school coffee dripper, and you know what? Its got me excited for lazy morning coffee rituals all over again! To make the dough, place the dry ingredients including the lemon zest into a large mixing bowl. Put the milk and butter into a small saucepan and gently heat over a low heat. Along with the beaten egg, add the mixture to the flour mix and stir to combine. Using a dough hook on a stand mixer, beat for 5 minutes until a soft, sticky ball of dough has formed. Cover with a tea towel and leave to prove in a warm place for one hour, or until the dough has doubled in size. To make the filling, melt the butter and chocolate in small pan over a very low heat. Once fully melted, set aside to cool slightly, around 5 minutes. Add the icing sugar and cocoa powder and whisk together until smooth. Once the dough has doubled in size, tip onto a well floured surface and roll into a long rectangle about 1/2 inch in thickness. Spread the filling over the dough, leaving an inch around the edge. Scatter over the chopped pistachios and sea salt flakes. Fold in half lengthways and gently roll to seal the filling, until about the thickness of a pound coin. To shape the babka, slice the dough rectangle into 4 equal width strips. Then, slice each of the 4 strips into 'trousers', i.e. leaving around 1/2 inch at the top unsliced. For each of the 'trousers' individually, plait together the two 'legs' before finally plaiting each of the 4 strips together. Don't worry this can be rough! Place the dough plait into a grease round baking tin, about 8-10", tucking the loose ends underneath. Leave to prove once more for around one hour, until the babka has doubled in size again. Alternatively, leave to prove overnight in the fridge and remove at least 30 minutes before baking to allow it to reach room temperature. Brush the top of the babka with the remaining egg and bake in the oven for 20-25 minutes. Once cooked, a the babka will be golden, springy and a skewer inserted will come out clean. To make the glaze, boil 75ml of water with the sugar until dissolved and of syrup consistency. 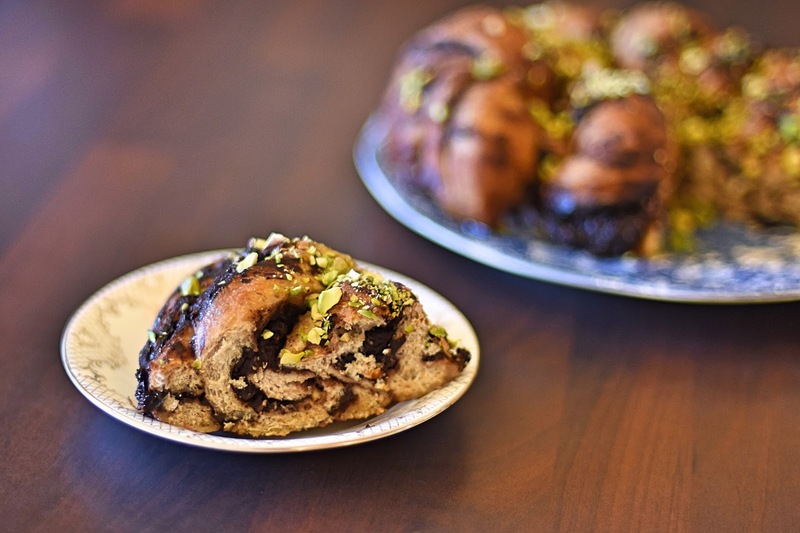 Remove from the heat before stirring in the vanilla, brushing the top of the cooked babka and topping with some extra chopped pistachios. Stores well in an airtight container for up to 3 days. Gently warm before serving if you like. That looks so good, I'm excited to try this.